If students are going to get the holiday, they should understand why. Kerrie Hollihan gives students the background for their Monday vacation in May. Author Hollihan takes the reader through a history of the important events that led to the establishment of Memorial Day. Challenge your students to extract the information she provides and create a visual timeline of events to summarize the article. A number of Memorial Day traditions are mentioned in this Minute. Ask students to identify the traditions that most closely align to the actual reasons the holiday was first established. Take a look at other annual holidays and ask students to identify traditions that may be part of their family culture, community traditions, state traditions and national traditions. Finish by asking them to think and write about why traditions are important. There is a tremendous amount of history to be gleaned from cemeteries, and the government office of Veterans Affairs does a great job providing maps of the more than 130 national cemeteries as well as state veterans cemeteries. Check out their site to find Memorial Day ceremonies scheduled across the country, as well as listing s for National and state veterans cemeteries and a database to search for specific graves. Taps is not the only recognizable song that comes from the bugle. Check out this page from the U.S. Army with more than 25 different bugle calls to download and play. How many do your students recognize? 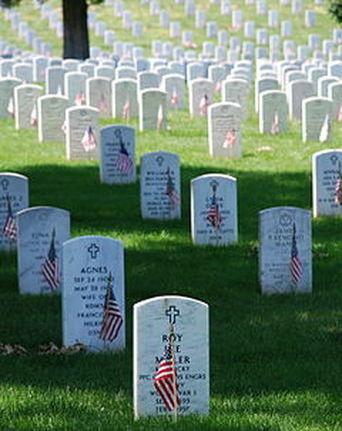 Memorial Day is a federal holiday, established by the government of the United States. See what government sites have to say about Memorial Day by doing a domain specific search. Domain specific searches follow this pattern: site:.ext keywords so to find out about Memorial Day history, the search would be site:.gov Memorial Day History. Have students compare the number of results to the search without the domain specific direction. Are they surprised by how many results they get?